Tumors, infections and injuries are common to middle-age dogs and the adult ones. A growth on dog’s eyelid can lead to ocular discharge and conjunctivitis which can worsen the condition. Mastocytoma, papilloma and histiocytoma are some of the most common canine tumors that can be surgically removed. A dog may experience eye irritation or interference when blinking due to the growth. Now let's get closer and find out more. Eye tumors on your dog can either be benign or malignant. A tumor in the eye can actually be caused by tumor cells that have developed in other parts of the body or may have developed from tissue changes in the eyelid. These conditions are quite common. 1. Eyelid neoplasia: A dark brown or pink mass appearing on the eyelid or on its margin is known as an eyelid neoplasia. When a dog has this condition, the tumor gets one or both eyes irritated and can change the shape of the eyelid. Viszlas and Weimaraners are commonly seen in this case. These kinds of tumors and their metastatic spreads develop very slowly. If surgery is needed, the functioning of the eyelid is a great concern. 2. Uveal melanoma, arising from the ciliary body or the iris of the dog, can be either malignant or benign and is quite common in Labrador Retriever. When this growth on dog’s eyelid is at an advanced stage, it can lead to glaucoma or retinal detachment and could be hemorrhaging. 3. Corneal squamous cell carcinoma happens when the epithelial surface of your dog’s cornea has a pink mass. This type of growth can affect the conjunctiva, the third eyelid and the eyelid itself. The lesions of this tumor are very aggressive and the tumor relapses even after it is removed. Corneal squamous cell carcinoma is mostly malignant and conjunctival neoplasia is always involved. 4. Orbital neoplasia makes your dog unable to move eyes in tandem and causes its pupil to dilate. Besides, the conjunctiva, the eyelid and the cornea may be swelling while the eyelid seems to protrude. Having poor prognosis, these tumors are mostly not painful but the worst part is that they can affect the oral cavity, the brain, the sinuses and the bones. Mostly, by the time you are noticing your dog has a tumor, it has already become malignant. If there is any eye discharge around the eyelid area, wipe it off with a warm and moist piece of cloth. If the tissues surrounding the eyelid tumor have not been affected and the tumor seems to be small, medical therapy can be really helpful. Chemotherapy maybe done or corticosteroids may be injected. The tumor may be frozen by the use of a method known as cryotherapy. If a veterinarian has diagnosed your dog with a lesion that turned out to be a tumor, they may recommend a surgical removal but before that, antibiotic and lubricating ointments can be used. A scalpel of laser maybe used in surgical removal of the tumor. For the benign tumors, it's curative with a complete excision. The growth on dog’s eyelid may be cured when tissues and the skin surrounding the eyelid are reconstructed with surgical techniques. In severe cases or when the surrounding tissues have been affected by the tumor, the eye maybe removed and the lids closed. Although there is no known preventative measure of dog tumors, reducing sun exposure can help in a great way. If your dog has an increased eye drainage, has a red eye that seems to be irritated, has a large abscess with an eyelash at the middle either on its lower or upper eyelid, then it is suffering from an eye stye. Now let's know more about this condition. The stye on your pet can either be external or internal and one important thing is to verify it’s not an infection but rather just a stye. Although the stye can drain on its own, you need to take the necessary measures to prevent further spreading of the condition. Ensure that you follow steps that will boost the drainage process. 1. Washing: Oil, dirt, dead skin and other debris that get too close to the dog's eyes can clog its hair follicles, causing the eyes to be red, puffy, swelling and irritated and leading to growth on dog’s eyelid. Wash the eyelid and its surrounding areas to remove all unwanted debris and bacteria. Use a clean piece of cloth or gauze pad for this purpose. 2. Compression: Mild heat usually relaxes and opens pores, encouraging draining and healing of growths. On the affected area, compress with a warm cloth several times throughout the day. Tea bags can also be used. 3. Medication: Ointments or eye washes can be used to treat a bacterial infection in the eye. In some instances, cortisone or oral antibiotics may be recommended. Cortisone reduces the severity of the inflammation and oral antibiotics can be put in foods. 4. Professional Removal: If all above methods fail and the growth really affects your pet, you can have it removed by a professional. Sedation will be injected beforehand to relax your dog. Then the vet will cut open the stye using a scalpel or sterilized needle to wipe away the infection. At last, you will have to apply saline eye wash or a common lens solution to the affected area to keep it clean. Owner safety: To avoid stressing your dog to a point that it can bite you when administering a medication, calm it down first and have someone help you with this. Wear some gloves first, use a muzzle and wash your hands during and after the treatment. ​ Another type of growth on dog's eyelid is sebaceous cyst. When a dog has an infection or debris, scar tissue or even dirt blocks its skin pore, it tends to develop what is called a canine sebaceous cyst or just a sebaceous cyst. This cyst develops under the skin and appears as a semi-solid or fluid filled sac. Sebaceous cyst on dog's eyelid can be a tiny pinpoint eruption on the lower or upper eyelid, which seems like a small whitehead. No treatment is needed if the growth doesn't change and your vet thinks it's no big deal. 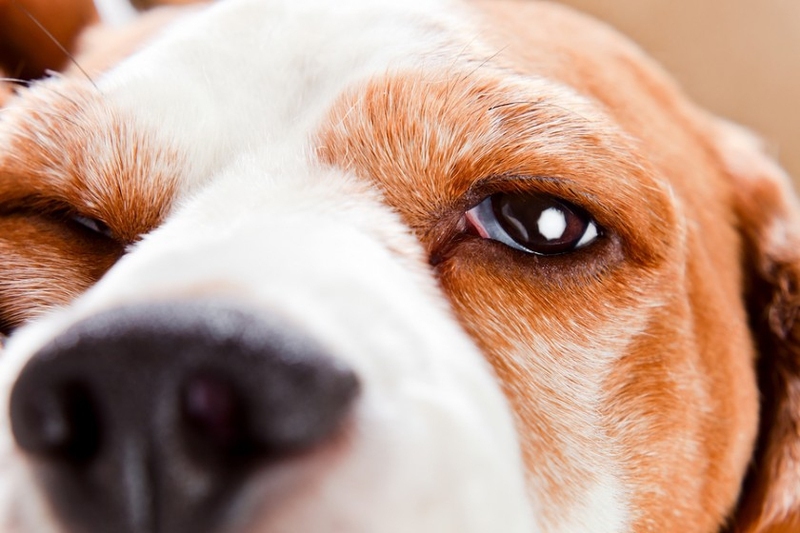 Your pet may tend to blink more and its eye may seem irritated. If the cyst develops to a point that it rubs against the cornea of the eye, your dog's life will be greatly affected. There will be intense corneal pain and medical attention is needed. In most cases, these sebaceous cysts can be left to heal on their own, but you should take your pet to a vet if the condition worsens or if you want to accelerate the healing process. Specialists may recommend a dog owner to lubricate the affected eye or eyes 3-4 times throughout the day. This helps to avoid pain or abrasion even if the growth rubs against the cornea. Sometimes a visible eruption is removed but the cyst may return if the meibomian gland, responsible for producing oil and creating inflammation, is not removed together. With benign tumor, your vet may recommend a specialist (a soft tissue surgeon or a veterinary ophthalmologist), who can successfully remove the cyst with eyelid reconstruction or tuned wedge resections. Note: When having the growth surgically removed, you should know that there will be risks involving the use of anesthetization.